Can I Fix My Broken iPad Screen? 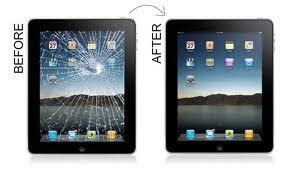 It's not easy, but with the right tools, and a bit of patience, you can replace the cracked screen and digitizer on your iPad in one to three hours for the fraction of the cost of having it done professionally. The tools and the replacement parts will cost between $50 and $150, depending on the iPad model and your parts source. (An out of warrantee screen replacement on an iPad-2 from Apple costs $255). Before you begin, check to see if your warrantee is still in force. If so, let the folks at Apple handle the repair or replacement. If the warrantee has expired and you plan to take this repair on yourself, remember that you are assuming the risk for damage, injury, or lost data. Watch a detailed tutorial video (short version below), and make sure that you are fully prepared to tackle this job. Make sure that you have the requisite tools, correct replacement parts, and a good set of step-by-step directions. You can fix an iPad 2 screen for just $45 and pink at that. Great article..It is very beneficial to the persons seeking for the ipad repairs.